The first time that I saw the book & elf, I noticed that it's like the elf that my mother bought when my older sisters were little back in the mid-50s. Mom's elf is dressed in green and always sat perched among the Christmas tree branches peering out mischievously. Now, she rarely decorates a tree but her elf is out every year! My sister has an elf for her 2 y.o. and they're having a lot of fun with it. I, however, am delighted that my girls are too old for this stuff. 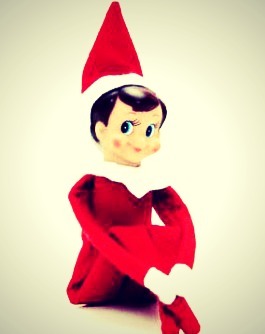 I'm just going to say it: The Elf on the Shelf FREAKS me out. A bunch of my friends have been posting Elf photos on Facebook. The first couple were cute, but the more I thought about it, the more terrified I became. Logically, I KNOW that the Elf isn't moving on its own. But if your Elf makes an appearance on your nightstand, and you didn't move it, don't tell me. Yup. Elf. Joy. My almost-7 year old has one of the creeper Elves in her classroom, and is always coming home with stories of it's adventures. She wants one here at home, and has enlisted the four-year old to her cause. I don't. Really. Don't. But think I might be fighting a losing battle. Ugh. This is one time that I am so glad that I don't have kids. No elves for this home. Besides all our dragons would eat him. Hey wanna borrow a dragon? Hmmm, we have several of these elves when I was a child in the 60's. But ours never sat on shelves. The hung from doorknobs or sat in the tree. Maybe I need to check out that book and see what all the fuss is about.....nah, I don't have little ones to please and my cat doesn't care. Have fun with yours though! I didn't read the Elf story and I am a bit terrified to do so now. But knowing you and Zack I think you'll pass this one just fine - maybe you can make that little Elf some jewelry and he'll be less creepy?! I have one of those in a box of stuff I got from my Grandmother. In the basement. In the dark. I hope the lid is tight. Dang it, Lori! Now I'm gonna have to sleep with one eye open! Very funny, fortunately my daughter was easily distracted at that age and any subject could be easily changed to cake. I had to give back my Mom's old china dolls because they just creeped me out. I can't remember the last time I laughed so much while reading a blog! Wishing you all the best in your search for a non freaky or at least a slighty less freaky elf as well a happy and warm holiday season. I have no idea what this Elf on a Shelf business is! I've seen it all over - especially on Pinterest but really don't know what it is?!? Glad to hear that Zack is going to get his elf. It's probably something that he will remember the rest of his life. My daughter is doing this with the kids this year and they called me the other day laughing that during the night, the elf had taken down all the Christmas stockings and replaced each one with their underwear! I remember how antsy the kids would get leading up to the big day and this activity probably takes the edge off and distracts them a bit from Santa seeing you while you're sleeping and awake! Have fun with it! Oh my gosh. I just laughed so hard. I think the Elf is totally creepy too. What is up with that?! What you end up doing to make your kids happy. I was good till you mentioned not finding onyour nightstand and all I can think of is that clown for poltergeist. I'm glad my daughter is beyond the "elf on the shelf" age --I have enough to do at Christmas without remembering to surreptitiously move an elf around each evening. We did have a stuffed monkey that moved around the house for a while --my husband would move him late at night, and Emma and I would move him in the mornings --he's little, purple, and has velcro hands. The fun was in being surprised at finding him somewhere. We were all aware of how he was getting from place to place! If this little creep showed up on my bedside table, his next job would be as a doggy play toy. Hysterical! I don't have kids but I would be behind on all the new things, too. Get the least maniacal elf you can find. This is the first year we've really gotten into elf antics. And, I have to say--I absolutely love it. The girls get a kick out of how mischievous this little guy is. The laughter, the conversations... all priceless. Tonight, he's making snow angels in flour--found that one on the web. Have fun with it =) I wasn't prepared to get such a kick out of it! My mom got one for my oldest's 3rd Christmas. (She is now 12). It's a pain to remember to move him and leave little presents (candy, hair clips, my sister leaves a few pieces of lego each night for her boys that gets built each day until the 24th). I cannot tell you how many nights my husband or I have woken up and had to move him or find something to leave. I sometime have good fun with him, like the morning he was playing old maid with the youngest girls barbies or posing in the nativity set. but I do run out of steam mid month. My feelings aside, both my kids still get SO excited about him and talk to him and it's a true tradition they LOVE. I have had a few times when they were fighting that the elf left only a note telling them his saw what they were up to and Santa was not amused and that straightened them up quick. It is what you make it. It can be creepy, annoying, or fun in that you are doing something to create memories of magic and the spirit of Christmas. I like magic! Lori - I love your writing! I have several great nieces & nephews & they are having so much fun with the Elf this holiday season. I saw one the other day at Target & there is a new one that doesn't look nearly as creepy. The other day my niece told me she came down the stairs to find the elf wrapped around the sugar bowl - with sugar spread all around him. She couldn't stop giggling over the antics of that silly elf. Hope you & Zack have fun!